Once a man had two sons. 12The younger son said to his father, “Give me my share of the property.” So the father divided his property between his two sons. 13Not long after that, the younger son packed up everything he owned and left for a foreign country, where he wasted all his money in wild living. 14He had spent everything, when a bad famine spread through that whole land. Soon he had nothing to eat. 20The younger son got up and started back to his father. But when he was still a long way off, his father saw him and felt sorry for him. He ran to his son and hugged and kissed him. 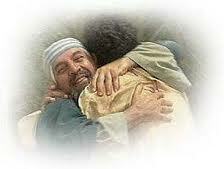 22But his father said to the servants, “Hurry and bring the best clothes and put them on him. Give him a ring for his finger and sandals for his feet. 23Get the best calf and prepare it, so we can eat and celebrate. 24This son of mine was dead, but has now come back to life. He was lost and has now been found.” And they began to celebrate. We have no idea if this is a true story or if Jesus only made it up to make a point. Our Father will always want us back. won’t stay that way forever. No matter what it is we’ve done, He is anxious to have us back. In fact, He will celebrate our return. Are you ready to return today? Just ask Him, he has a celebration waiting for you!